It has been a long time since I watched my last korean drama, which was Kill Me Heal Me, and I haven’t been able to find any dramas that interests me… until I read a synopsis of a new MBC drama called “She Was Pretty”. I’ve heard a lot about this new drama because Hwang Jeong Eum and Park Seo Joon has reunited for this drama after KMHM, and there’s also SIWON and YOOHWAN (yoochun’s brother… such a cutie pie). The first episode already left me wanting for more, I love how korean dramas always make you excited about watching the next episode – which is often not the case for Singaporean dramas, where you can miss an episode or two and you can easily catch up. Korean dramas are much more concise, I would say. Hwang Jeong Eum’s acting skills are somewhat the same as that in KMHM. She still screams a lot and her acting could come off as being exaggerated. But maybe it’s due to the nature of her roles in KMHM and SWP, her over-the-top acting makes her characters in both dramas equally loveable and comical. For Park Seojoon… he’s such an eyecandy :D omg LOL. I generally like tall guys who look good in suits and park seojoon totally fits the bill. SO CHARISMATIC AND HANDSOME RIGHT!!!!!!!! and you’ll melt into a puddle of goo because his eye-smile is so adorable! 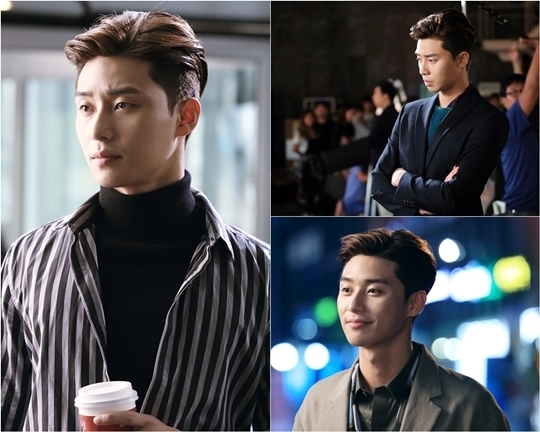 Park Seojoon’s role in the drama seems to be a little bipolar. He’s super annoying and rude when he’s working (but can’t blame him for that since he has to be strict to his subordinates) but at the same time, he’s super sweet to Kim Hyejin (aka the girl from his childhood memories). Siwon’s character is just a crazy guy lol —- SIAO GIN NA. In the drama, he acts like a homeless guy with an unkempt appearance but is someone who is actually the heir of some huge company. In real life he’s SO RICH okay. Siwon is my eye-candy No. 2 in the drama because Park Seojoon is closer to my ideal type in terms of appearance. LOL. And lastly there’s cutie-pie yoohwan, aka yoochun’s brother! I didn’t know he was involved in this drama, so his appearance was like a cherry on top of the cake. He’s so cute and fluffy in the drama, always calling Kim Hyejin “Hyejin Noona!” So polite :D and he does some aegyo in the drama too. So cute! I hope this drama will have a good ending… most of the dramas I’ve watched have disappointing endings! BUT BUT BUT I hope Hwang JeongEum will not end up with Siwon! I mean, he likes her but Park Seojoon is more handsome haha I support PSJ!! !